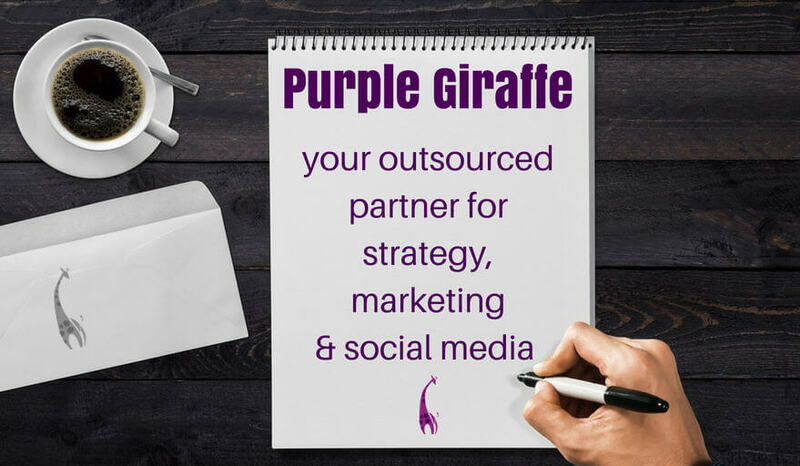 Purple Giraffe - Why Outsource Your Marketing? Like many small to medium sized businesses, you’re busy everyday getting your hands dirty and doing the do. Having your own business is rewarding and inspiring, but it often means wearing a multitude of hats and being an expert in things that you don’t necessarily know all that much about. Thank goodness for Google! The good thing is there is help out there. It’s called outsourcing and sometimes it’s the smartest and quickest way to get the best results and fast track your business growth. You can outsource pretty much everything from doing the books, to packaging up product, catering, legal advice and marketing. Marketing is often one of those areas that can be neglected as a “nice to have”. However, the reality is, it’s a vast and complex area of expertise and if you don’t do it well (or at all) your business is at risk of failing. Making the decision to outsource your marketing, or keep it in house, is difficult and can challenge the way your business runs on a day to day basis. It’s handy to look at it from this perspective – unless you find the all-in-one fairy-tale marketer with the right mix of strategy, new age knowledge and know-how, events, digital, writing, PR and creative design experience – then your in house marketing team has grown to be a three member department in itself. That’s expensive for a ‘nice-to-have’! However, if you outsource this function then you can access all of this expertise at a reasonable cost to your business. Breadth of expertise – Outsourcing your marketing provides access to expertise across a vast array of marketing disciplines accessible through an experienced team that you build a trusted working relationship with. This expertise and flexibility is the most important benefit of outsourcing your marketing function. Pay for what you need – Depending on how your chosen outsourced marketing expert works and what your arrangement with them is, you only pay for the services you need for the length of time you require. This also mitigates the risk of bringing on new staff and allows you to control your marketing spend to suit your budget. Valuable insight – By wearing different hats to manage a variety of client campaigns, an outsourced agency is often able to bring a different perspective to an existing challenge, a higher level of creativity and experience to your ideas and they will not get bogged down in any internal politics or restrictions. Staffing benefits – You don’t need to recruit, retain or train staff. Your outsourced marketing agency is responsible for providing you with the right skilled people to manage your account. In addition, you don’t need to employ a person, therefore no work cover, superannuation, insurance, phone, laptops and/or other costs for this staff member. Keeping on top of the latest trends – It can be easier for specialist marketers to keep on top of key marketing trends and recommend how these can be integrated into your business marketing strategy. Digital marketing – a space that is changing every day. Marketing experts invest large amounts of training and resources into keeping on top of digital marketing opportunities. Focus on marketing – an outsourced marketing expert will only work on marketing for your business. It sounds obvious but many internal marketers face the challenges of being pulled onto a range of different projects and assignments that aren’t always relevant to the marketing program. Availability – you outsourced marketer is available to you every day of the working week, no need to wait for the part-time staff members day in the office. So the question is – why wouldn’t you outsource your marketing? To get in contact with Lynda at Purple Giraffe Marketing click here. All of the above views are the ethos of Purple Giraffe and may not be that of ALL outsourced marketing providers.